(2009) Published by The Tun Jugah Foundation. 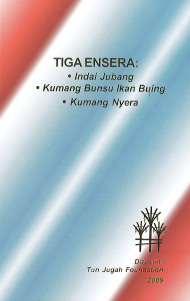 Tiga Ensera (Three Stories) is an anthology of three stories, namely Indai Jubang (Mother of Jubang), Kumang Bunsu Ikan Buing (Beautiful Buing Fish Maiden) and Kumang Nyera (Kumang is Food-craving). The three stories are the prize-winners in the Folklore Writing Competition organized by the Tun Jugah Foundation. The first story is about frustrated Indai Jubang who, after losing a communal war where all men from her longhouse were killed, gathered all of their charms and amulets and flew them to the territories of their enemies. These charms and amulets have caused their brave enemies to fall sick, and one of them is Keling of Panggau Libau. The second story is about a war expedition led by Keling to the country of Raja Ribai in order to rescue Ngelai, a brave warrior from Panggau Libau. The last story is all about efforts carried out by Keling and his men, who try to rescue Kumang, who is suddenly discovered lost from their community in Panggau Libau.